There are many ways to perform your abdominal workout. The superset technique is an advanced technique that can increase the intensity of your ab workout and make it more efficient. If you're read the page with 6 straight set ab workouts, then you know that in the straight set technique you focus on 1 ab exercise for 2-3 sets before moving on to the next ab exercise. 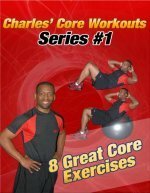 And if you've read the page with ab circuit workouts, you know that circuits use a list of 3 or more abdominal exercises that you would perform in a row without resting. The superset technique simply pairs 2 ab exercises together. When you do a superset, you perform the first abdominal exercise and then with no rest move to the second abdominal exercise. Rest 30-90 seconds after the second exercise. Then, repeat the superset 1-2 additional times. Obviously, your abdominal workout will be harder if you do 2 ab exercises in a row, and you will also save time because you will spend less time resting in between sets. Below are 3 supersets for the abdominals. If you are a beginner, pick one superset and do the superset 2-3 times.If your fitness is intermediate, pick 2 supersets.And, if you are in great shape, try all 3 supersets. Aim for 10-25 repetitions per exercise. Focus on 2 ab exercises at a time. Complete 2-3 rounds of each superset before moving on to another superset. Work your abs 2-3 times a week. You can click on the picture to get more information or additional tips and instructions. The first superset pairs Crunches and Leg Raises. Perform 10-25 crunches and then move directly to 10-25 repetitions of leg raises. With the Ab Crunches, make sure you lift your shoulders off the floor, and hold briefly at the top before lowering back towards the floor. Use your hands only for light support. During Leg Raises, maintain good posture for your lower back throughout. If you feel your back arching, don't lower your legs as close to the ground or rest. The second superset pairs Russian Twists with Oblique Floor Crunches. Perform 10-25 repetitions of the seated Russian Twists and then without rest perform 10-25 oblique crunches. For the Russian Twist, each time you twist towards the right is 1 repetition. Lean backwards far enough to feel your abs working, and move in a rhythmic fashion. 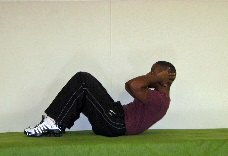 During Oblique Crunches remember to lift your shoulders off the floor. Breath out as you crunch towards your opposite knee. Perform 10-25 repetition on each side. The third superset combines bicycle crunches with the plank pose. Bicycle crunches are one of my favorite ab exercises. Everytime you touch your right knee with your left elbow is 1 repetition. Aim for 10-25 repetitions before moving on to the plank. The Plank is an isometric exercise. Simply balance on your toes and elbows and hold for 30-60 seconds. Don't worry if your start shaking. Keep your back in good alignment throughout. A Superset Abdominal Workout could really save you time and increase the intensity of your workout. I tend to do supersets not only for my abs but for other muscle groups also. I don't want to slave away in the gym and niether do most of my clients. So we use supersets to get more done in a shorter period of time. You can pair any 2 ab exercises to make a superset. Directory of Abdominal Exercises to create your own supersets. Try a few supersets in your next abdominal workout. You might like the technique so much that it may become your favorite way to exercise your abs.